IN 1785, JAMES MADISON issued a warning in his famous “Memorial and Remonstrance”. A tax to fund the salaries of Christian teachers would put America on a dangerously slippery slope, he wrote. The “same authority which can force a citizen to contribute three pence only of his property” for one sect may one day compel him to pay for “any other establishment”. Today, Madison’s strict no-aid principle does not characterise America’s church-state relationship: tax exemptions for churches, textbooks for religious schools and renovations for church day-care playgrounds are just three examples of faith-based organisations drawing on the public purse. On March 4th, the Supreme Court issued a mixed message on how much further America would stray from Madison’s admonition. 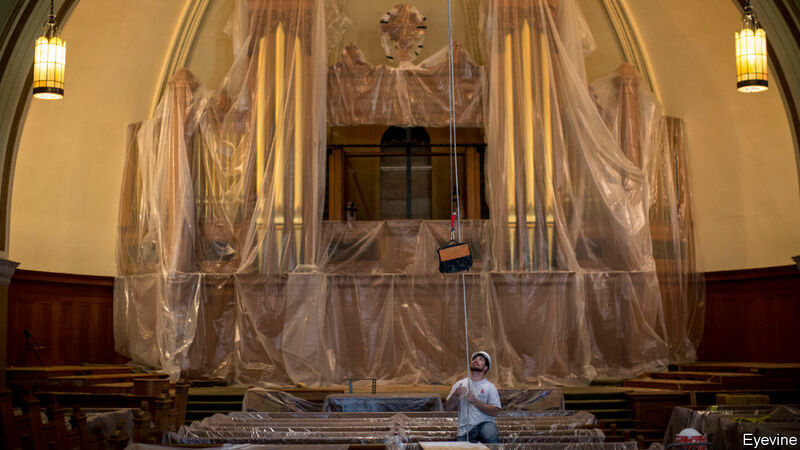 It declined to entertain a plea requiring taxpayers to pay churches for repairs to their buildings—but three justices promised to do just that as soon as a more appropriate case came their way. There are two questions at the core of Morris County Board of Chosen Freeholders v Freedom From Religion Foundation, decided by the New Jersey State Supreme Court in 2018. First is whether a New Jersey county board—in awarding $4.6m of renovation funds to twelve churches between 2012 and 2015—violated a clause in the state constitution guaranteeing that no one will be required to pay taxes “for building or repairing any church”. The answer, New Jersey’s high court concluded unanimously, is yes. But the second matter is more vexed: does the no-aid clause in New Jersey’s constitution violate the federal constitution’s guarantee of religious free exercise? If so, the state’s funding rule must bow to the requirement in the federal Bill of Rights. Until two years ago, the second question might have received short shrift. In 2004, the Supreme Court upheld a programme in Washington state providing scholarships for college students in all fields except theology. Consistent with a no-aid provision in its own state constitution, the court held 7-2, Washington “has merely chosen not to fund a distinct category of instruction” and had a “historic and substantial interest” in keeping state funds away from religious activity. But in a 2017 decision, the Supreme Court decided that a Missouri rule prohibiting aid to churches could not exclude religious pre-schools from a programme to resurface playgrounds with recycled tyre scraps. Writing for the majority, Chief Justice John Roberts’s ruling was both sweeping and small. Excluding a church from “a public benefit for which it is otherwise qualified, solely because it is a church, is odious to our Constitution…and cannot stand”, he wrote, before adding in a footnote that the ruling applies only “with respect to playground resurfacing”. The narrow path forged by Chief Justice Roberts’s opinion was not welcomed by every justice who joined in the judgment. Justices Neil Gorsuch and Clarence Thomas criticised the footnote’s suggestion that only public benefits “with some association with children’s safety or health, or perhaps some other social good we find sufficiently worthy” must be doled out even-handedly to secular and religious entities alike. This conclusion is “unreasonable”, Justice Gorsuch wrote in a concurrence, as “general principles here do not permit discrimination against religious exercise—whether on the playground or anywhere else”. This fractured conservative reaction in Trinity Lutheran v Comer, the 2017 decision, seems to have foretold this week’s result in Morris County. Justice Brett Kavanaugh wrote a statement respecting the denial that highlighted the precise concern Justice Gorsuch, his fellow Donald Trump appointee, voiced two years ago. The New Jersey Supreme Court’s ruling prohibiting state funding for the repair of religious buildings lies in “serious tension with this court’s religious equality precedents”, he wrote. To exclude “religious organisations because they are religious from a general historic preservation grants programme”, Justice Kavanaugh wrote (joined by Justices Gorsuch and Alito) is “pure discrimination against religion”. Following this unequivocal statement, the three justices nevertheless noted their agreement that the Supreme Court should not take up Morris County. Their two reasons for this are curious. First, Trinity Lutheran is too fresh on the scene, Justice Kavanaugh wrote, and “there is not yet a robust…body of case law in the lower courts” to clarify whether states must consider historic preservation grant requests from religious entities. This is a rather odd statement coming on the heels of an unambiguously stated principle that excluding churches from such programmes is anathema to a long line of Supreme Court precedent. The other reason Justice Kavanaugh cited points to—but masks—the real reason he and his colleagues demurred: “the factual details of the Morris County programme are not entirely clear” and it is “not evident precisely what kinds of buildings can be funded under the Morris County programme”. According to Andrew Seidel, a lawyer at Freedom From Religion Foundation who has handled the Morris County litigation, the factual details of the programme are, in fact, clear—and appear to favour religious entities. Far from an all-comers policy designed to open funding streams for any historic buildings needing restoration, the organisation’s brief reads, the programme was “open to all churches and government buildings, but only to a small subset of secular nonprofits”. While churches are embraced, “[i]ndividuals, for-profit businesses, and most secular nonprofits are excluded from the county’s program even if they own and maintain historic buildings”. And many of the churches receiving the funds “disclosed…exclusively religious purposes” for applying for the grants. One applicant even clarified that “historic preservation” was explicitly not its aim, as “the sole purpose of a church is spreading the gospel of Jesus Christ”. Given this factual record, Justice Kavanaugh and his colleagues may have been hesitant to use Morris County as the vehicle to move the First Amendment toward a principle commanding the government to fund religious entities equally under grant programmes. It seems the county board wasn’t just funding churches—it was favouring them. Why didn’t Justice Clarence Thomas or Chief Justice Roberts join Justice Kavanaugh’s statement? Probably for two different reasons. Justice Thomas may have cast a lonely vote to hear the case, untroubled by the apparent pro-religion stance of the county board and still unhappy with Locke v Davey, the 2004 theology studies case from which he dissented. Meanwhile, the chief’s decision to pass on Morris County, in Mr Seidel’s eyes, may stem from his recognition “that this is the core principle of both religious liberty and disestablishment” and doesn’t want to oversee “the dismantling of one of our founding principles”. Chief Justice Roberts may also have his eye on the prospect of organisations other than mainstream churches “syphoning off the public spigot” (as Mr Seidel puts it) if all funding streams were opened to religious entities. Madison’s worries about the potential for conflict when faith communities scramble for taxpayer dollars could well underlie the chief’s careful path in cases like Trinity Lutheran: the constitution requires evenhandedness when funding secular goods, wherever they are found, but permits states to keep taxpayer dollars away from explicitly religious pursuits. The right edge of the Supreme Court seems keen to erase that distinction; for now, the chief is holding the line.